Print La Terre from a set of the Four elements, an etching by by Pierre Aveline, after a drawing by François Boucher, published by Gabriel Huquier, 1738-1749. 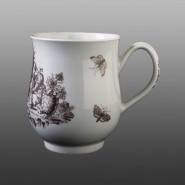 Shown here is a side view of the mug revealing the moth prints added to the sides. A soft paste porcelain bell shaped mug printed in brown in a Chinoiserie design. The front is printed in black with a version of La Terre, a Chinese-style scene with a woman and two boys tending exotic plants. The design is based on an engraving by the French engraver Peirre Aveline after a drawing by Francois Boucher.